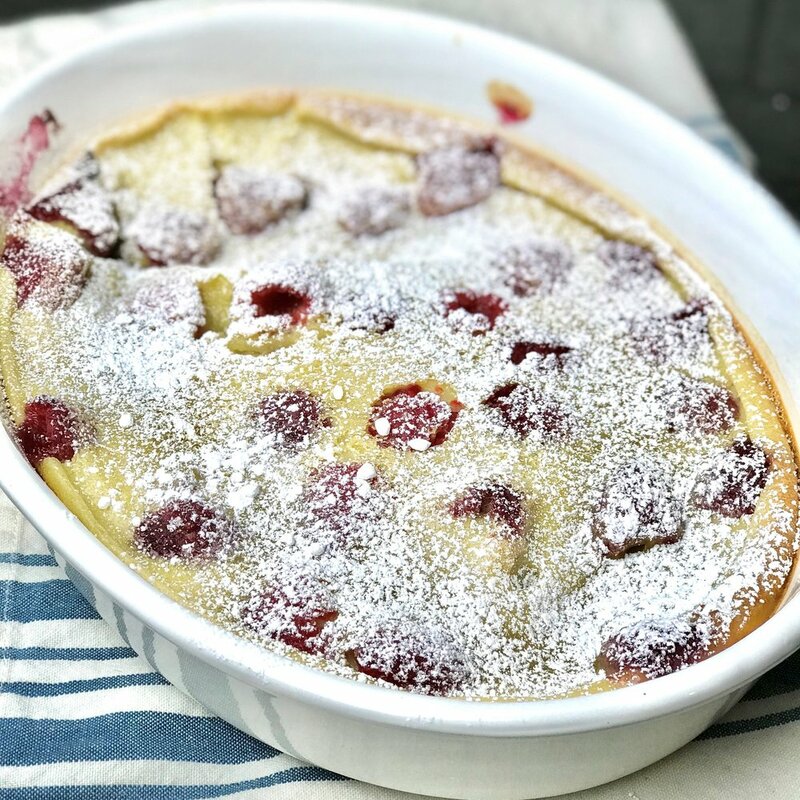 Growing up, my food inspiration always came from watching the women in my family cook—from my Aunt Debbie’s awe-inspiring desserts to my Aunt Carole’s chicken pot pie. And my Mamaw spending all day in the kitchen preparing Thanksgiving dinner. They were always my heroes when it came to food; I love how much pride and care they took to whatever they were creating. I never watched a lot of TV growing up, but I do remember Julia Child. And her laugh. Since this is Women’s History Month and the challenge is to pay tribute to a famous female chef, I am tipping my hat to Julia—for all of the women chefs in my family, and all the other great women who have pioneered the way. I put my own spin on this recipe by making it dairy-free, opting to use almond milk instead of whole milk. I also decided to use some great raspberries that I found, and added a little chocolate for good measure. The best thing about this recipe is that almost the entire thing is made in the food processor/blender, and it is pretty much foolproof! 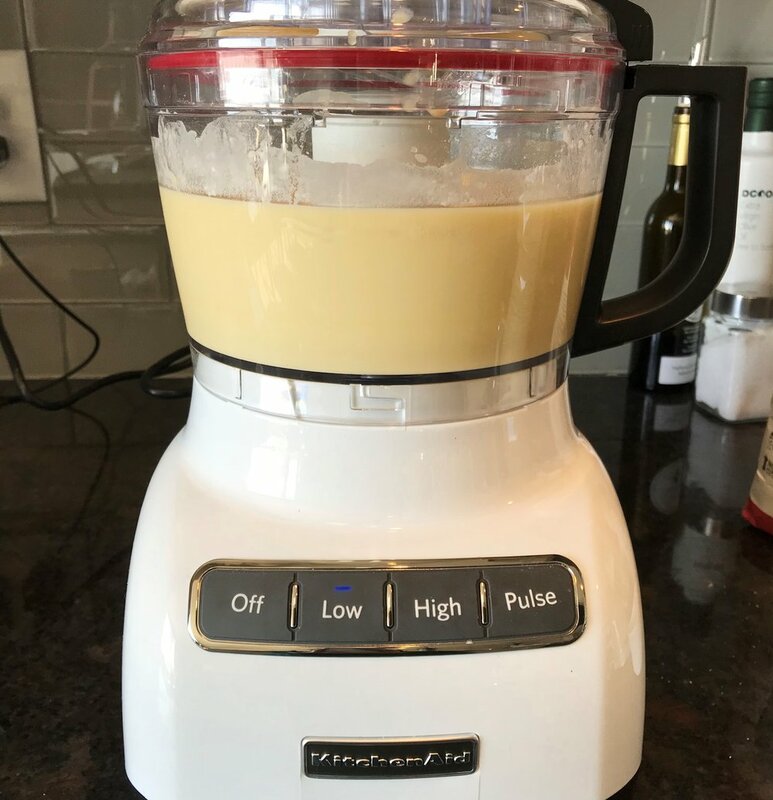 Using a food processor or blender, add the almond milk, ⅓ cup of the sugar, the flour, eggs, vanilla extract, and salt, and blend until sooth. 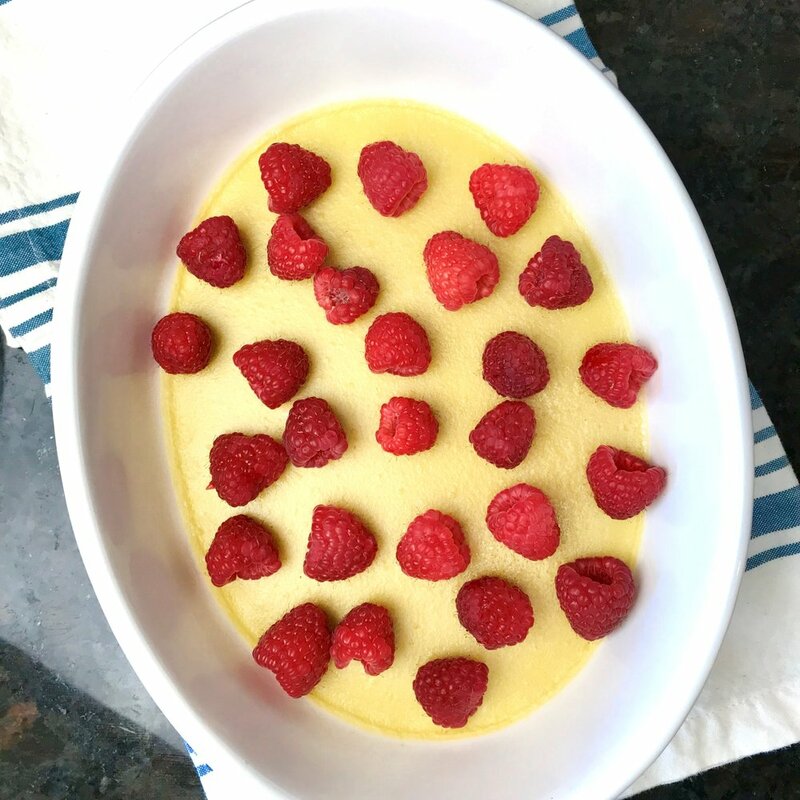 Lightly butter a baking dish, and pour a ¼-inch layer of the blended milk mixture into the bottom of it. Place the dish in the oven and bake until the batter is barely set, but not fully baked—about 7 to 10 minutes, then remove from oven. 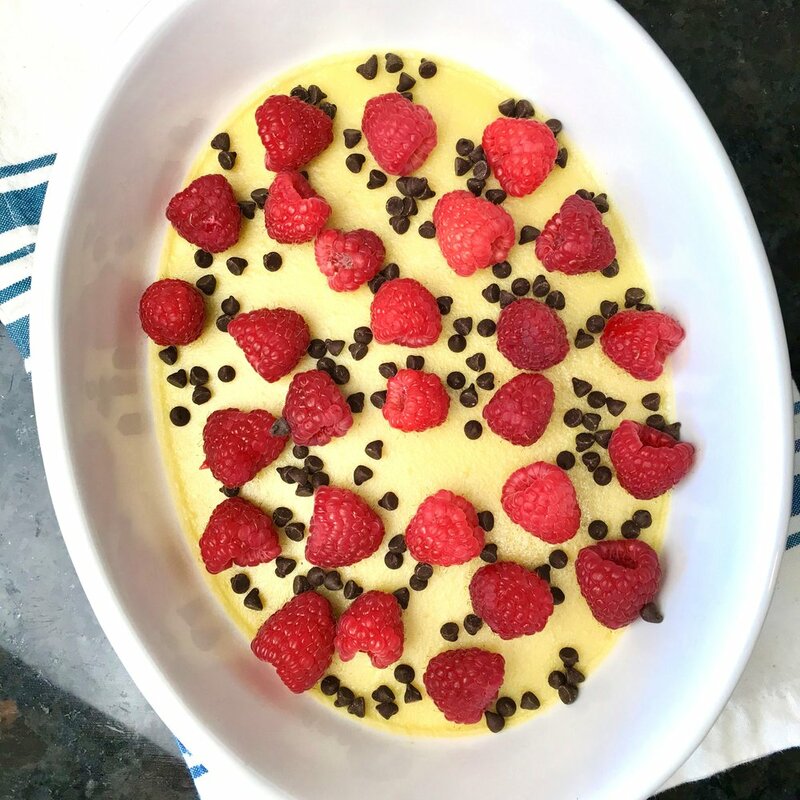 Distribute the raspberries evenly over the top of the semi-cooked batter, then sprinkle the chocolate chips on top. Next, sprinkle on the remaining ⅓ cup sugar. Then pour the remainder of blended batter on top of the raspberries and chocolate. 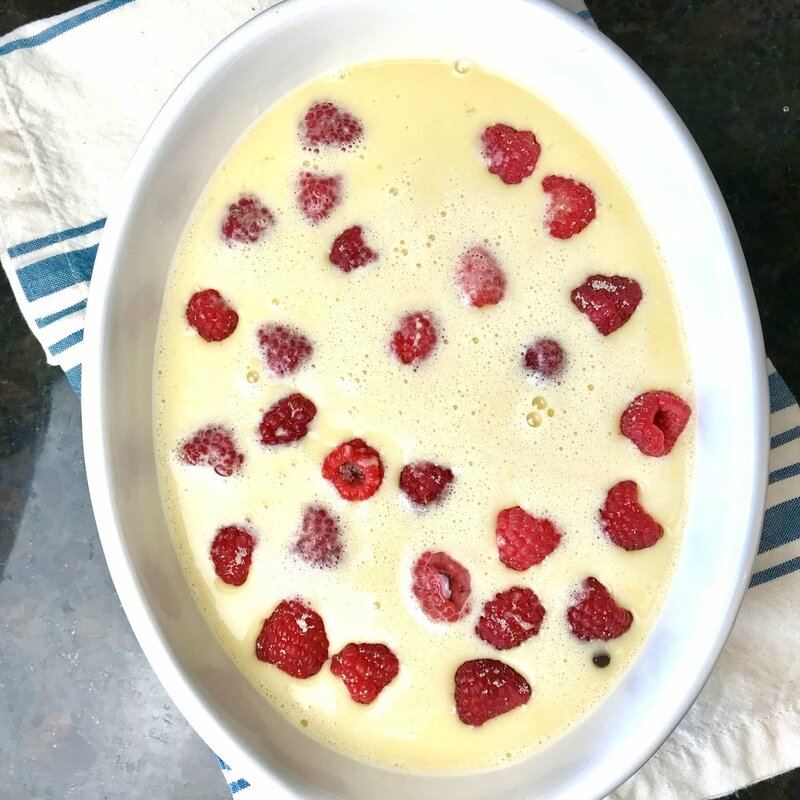 Bake in oven until the clafoutis has puffed up and is golden brown—35 to 45 minutes. Test with a knife or toothpick for doneness. To serve, dust with powdered sugar and ENJOY!